Here is our new strip reprint series, an eight week or so sequence from The Bells from October to December 1949. I really enjoy this strip's gentle good-natured humor and the warm interaction in the family. The initial sequence, about buying a mysterious item at an antique auction is a special favorite for me being as how I'm an auction junkie myself. I know the cartoonist only as Leed - he or she never signed the strip, just took the byline. This strip only appeared in one newspaper - anyone know which one? If not, you can find out in an upcoming issue of Hogan's Alley. Now here's a strip that just has to make you wonder, "What were they thinking?" As you can see, the star of this strip is none other than famed movie director Alfred Hitchcock. However, the strip isn't about a movie director; the titular Alfred here is portrayed as a mute nebbish living in the 'burbs. Why? I dunno. Did Hitchcock know of the existence of the strip? Did he approve of it? I dunno. What I do know is that the strip debuted on October 17, 1949 and lasted until sometime in 1954. The creator, uncredited on the strip itself but listed in E&P, was Carl Ryman, of whom I know nothing. Can anyone help unravel the mysteries of Alfred? PS: blog reader Alan Gardner asks if anyone can supply information on a magazine gag cartoonist of the 50s-70s named Don Gilbert. I have no information in my files. Can anyone help Alan? PPS: I have been called out of town again, much sooner than expected, and we will have another strip reprint interlude beginning tomorrow. The tepid response to Jack Daw's Adventures has resulted in his retirement, so we'll be doing a different strip this time. As a correction, the gag cartoonist I'm searching for is Don Gilbert, not Don Gardner. Thanks. Sorry, Alan. I've corrected it on the post. Alfred was a cartoo series by artist Foster Humfreville in Collier's. I am posting some on my blog today. It started as a Navy cartoon, possibly for some sort of Navy paper. The style here is the same as the cartoon's so either Humpfreville is Carl Ryman or there is some sort of connection. I think the character was based on Hitchcock before he became superfamous. The cartoons end in 1949, so that fits. I thought of Hugh Herbert first rather than Hitchcock when I saw this cartoon character. 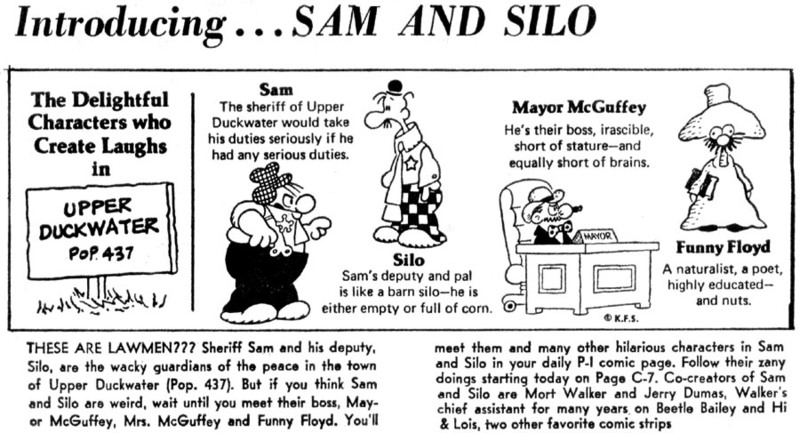 Here's the introductory strip for Sam & Silo, which ran on 4/18/1977 to accompany the first daily. This strip was a reworking of the classic Sam's Strip, Mort Walker's great feature that paid tribute to the history of comics and humorous illustration. Sam's Strip, with its self-referential humor, wasn't a big hit with the masses, and lasted less than two years (10/2/1961 - 6/1/1963). Over a decade later, Mort Walker and Jerry Dumas teamed up once again to bring the main characters back, but this time in a strip more fit for general consumption. Sam And Silo specializes in slapstick, vaudeville style humor, and has stayed in syndication now with the new formula for almost three decades. Dumas took over full credit for the strip in 1981, and the Sunday strip seems to have been dropped around 1995. Sam And Silo is one of those strips that you never seem to see in newspapers, but yet still continues in syndication year after year. Perhaps it does well in foreign markets? The Captain And Mandy by Steve Kell, from Universal Press Syndicate, ran 8/20/1978 - 2/25/1979 (dates from Dave Strickler's LA Times index). This strip presented us with the novelty of a female airline pilot, a rarity still today, and tried valiantly to be feminist. Being that the cartoonist was male, sometimes the attempts at feminism ring hollow, and sometimes Kell would switch camps and make jokes of the male chauvinist variety. This slightly schizophrenic writing style probably had something to do with the strip's early demise. Kell's cartooning ability, pretty rough at the start of the strip, was improving markedly by the time the strip got the ax. Kell probably could have had better luck on a second strip, especially if he found a writer to partner up with, but instead he shifted his focus away from newspaper comics on to greeting card work and painting. Some of his later work can be seen at his web site. Thanks for the info on the later date. Now that I know we don't have the right end dates, I've emailed Steve Kell to see if he can supply definitive end dates. I'll let you know if he responds. By the way, I would ask that you have mercy on my poor dial-up internet account - the attachments you sent were over 10 MBs and took about two hours to download. You can significantly reduce the resolution at which you scan, and the resulting images will still be just fine, especially for viewing on screen - try 100 dpi for color images, 150 for black and white. Steve Kell writes back that he doesn't see anything later than 4/8/79 in his files, but that his files are not trustworthy. Oh well. By the way, Steve Kell was a pilot for PSA at the time he was doing this strip.